After King's send the fourth prince as an ambassador to Jin to knew their true motives. 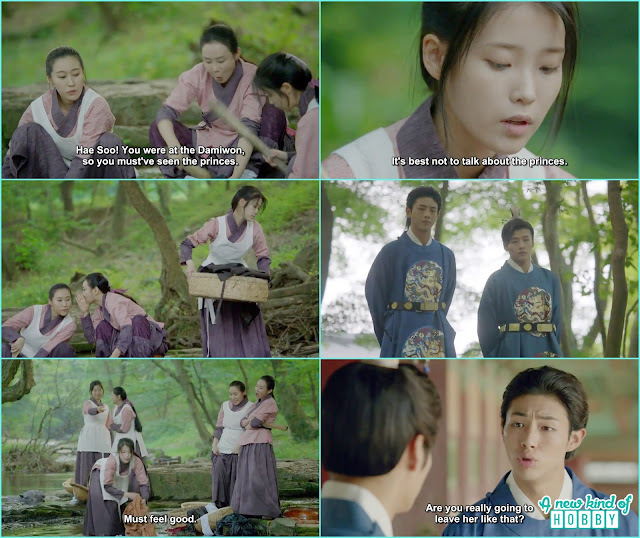 Before leaving the forth Prince ask King to have mercy on Hae Soo as she had no where to go. As Soon as the 4th Prince left king ordered Ji Monk to send Hae Soo far away so the prince won't be able to see her any more. 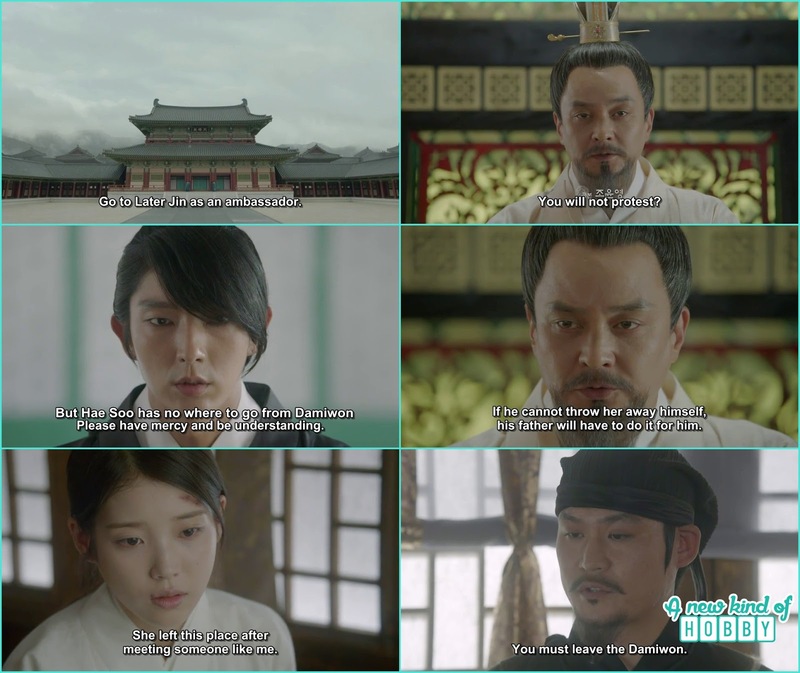 Hae Soo received the order of the King and she was expected to be thrown out of the palace. She was on her way to her quarter she encounter the 4th Prince. She was surprised to see him. Prince Wang So told her to stay healthy and wait for him at Damiwon until he return from Jin. He became too of charming as he take off the mask. Now we can clearly see his innocent face and all romantic gazes for Hae Soo. This time he didn't miss a chance and showed his another cute side. He suddenly pull Hae Soo as if he would kiss her but then seeing her shocked expression he let her at ease and said i already told you i won't do it without your permission. Hae Soo who was all worried thinking of something else shocked to listen and the 4th Prince Wang So stole a kiss from her. Smiling suspiciously he said "I lied you abut that". Hae Soo on the way to the quarter saw the 8th Prince Wang Wook walked away. Wook still didn't realize what he lost. 4th Prince left for Jin as an ambassador. He wear his mask and it look like the old Wang So warrior is back. The 14th Prince break the news about Hae Soo being kicked out of the palace to 8th Prince Wang Wook and ask him to help. But that coward don't have enough power neither courage to do anything for Hae Soo except he came all the way to his quarter cried there and called "Soo , Soo Soo " which irritates us. Princes Yoon Hwa came to meet Queen Yoo and they had very sweet chat. Queen Yoo compliment her as a child who born from his womb. Listening this compliment Princess Yeon Hwa knock out Queen Yoo by using the sweet bitter words and reveal her secrets from the past. Queen Yoo killed court lady's Oh child and accused her mother and she got being exiled. 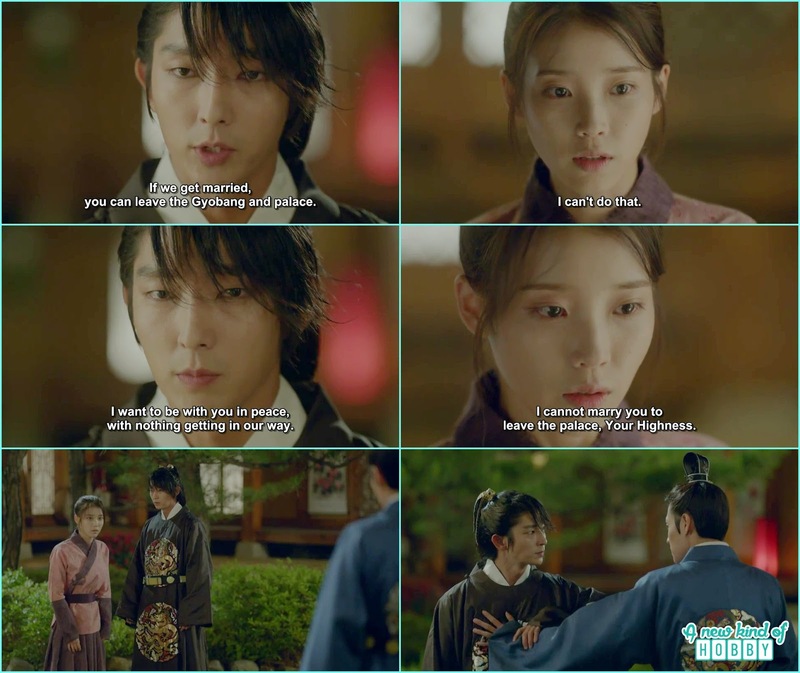 It was a warning for Queen Yoo not to mess with her family and nor made her mother beg infront of her any more. What if she continue she will have t face the consequences as no body else knew about the truth about the poison incident later. Moreover the king won't suspect Yeon Hwa as she drank the posion infront of him. Waah and Queen Yoo listening this become an statue. That little brat had the courage to make Queen Yoo stay put. One year passed so quickly and for us it look like the second moment. Seeing the Princess new getup and hair style our eye pooped out specially the 3rd Prince Wang Yo. He was annoyed as usual. 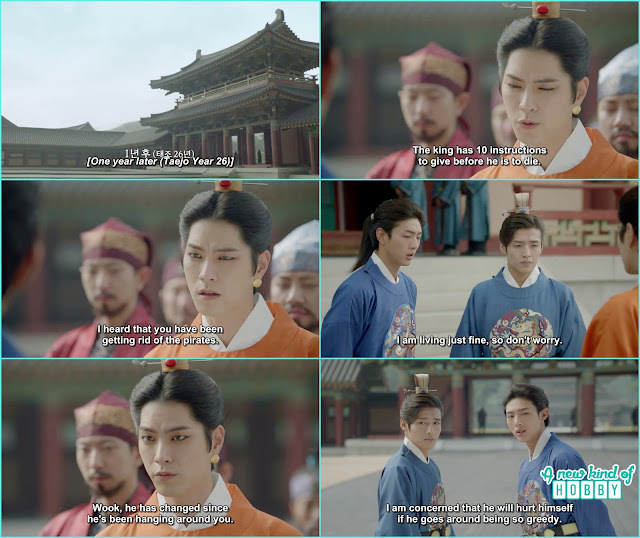 The 8th Prince Wang Wook become a bit mature by his appearance and we are not sure about his words and actions. As for the 14th Prince Wang Jung he become an adult now, we were happy for him. Baek Ah the 13th Prince become more adorable and charming. He frequently visit the Gisaeng house to play music and its not only just music he become a little close to Woo Hee who use to practice sward dance over his music. It was a scene we enjoyed where Baek Ah didn't miss a chance to tease Woo Hee and she misunderstood Baek Ah to be a married man. Yeon Hwa was still as arrogant and ignorant, the third prince finally propose her with a ring. Oh Man whats's this on earth after all she is his step sister but still he wanted to marry her. May be the norms and values in Goreyo didn't follow such ethics. Wook happen to came when Yeon Hwa was about to give an answer for the ring but she couldn't say anything about but hide the ring. 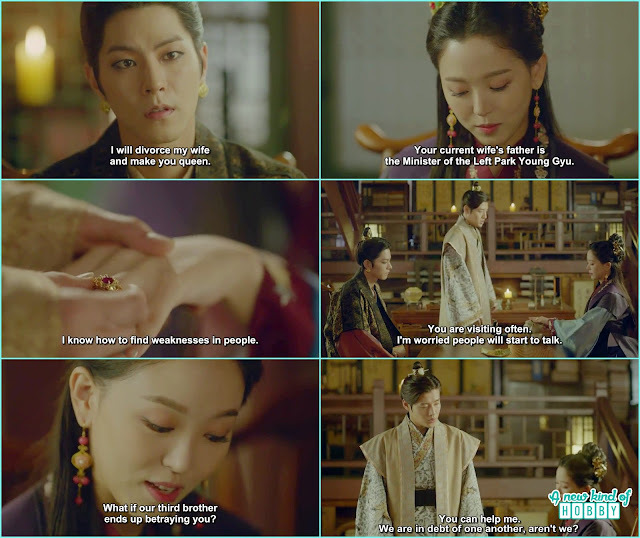 The coward Wook caught on Yeon Hwa's weakness and ound about the ring she received from the 3rd Prince Wang Yo. Things will surely become more of interesting as we never imagine they would take this path. 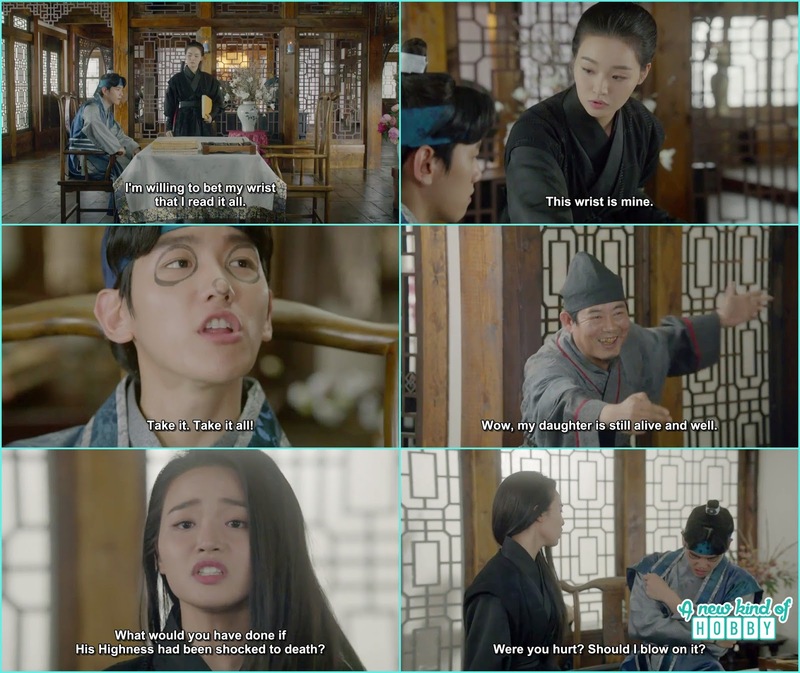 We feel really sorry for Hae Soo she been kicked not from the palace but thrown to the lowest place as the water maid. Her life become more of miserable as she still hadn't recovered from the inner injury of her leg. She was bulling by the other maids still she didn't leave that place. Neither said anything back to them. She already knew it won't help her but make her position even more worse as she is the alone and the weak one among them. The 14th Prince Wang Jung and the 8th Prince Wang Wook happen to see Hae Soo being bullied by the other maids but couldn't help them as it was king's order if someone found to be near Hae Soo he will also receive the sever punishment. The 4th Prince Wang Soo made it a successful trip to Jin as an ambassador and came back. King was very happy the 4th Prince fullfil his expectations. Now king demand more from him and order him to visit Khitan. 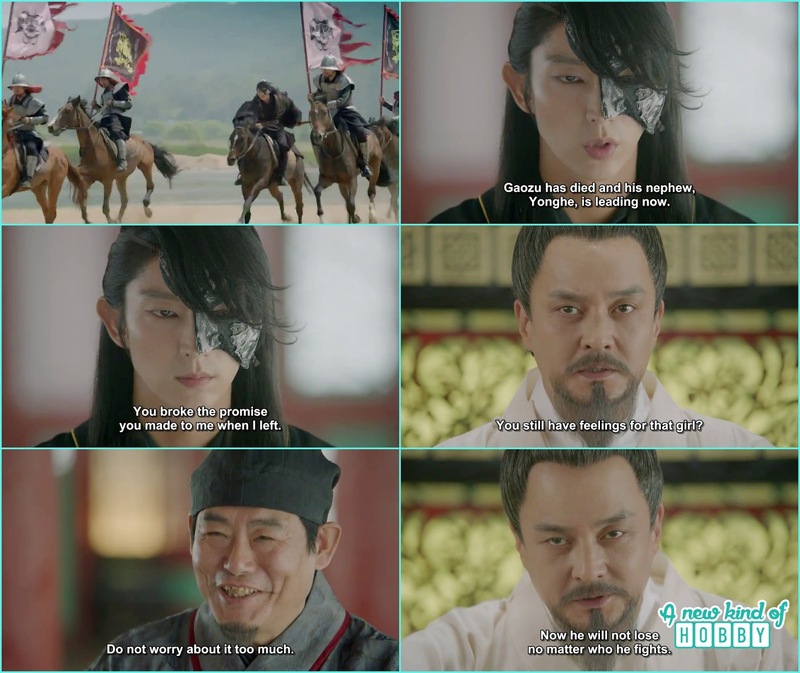 The 4th Prince to refuse to accept King;s command as the King didn't keep his promise and kicked out Hae Soo from the palace. He was bold enough to talk back to the king without any fear. Hae Soo after washing the clothes was at the dry yard. She felt she saw something but thought its an illusion and then started her work again. It wasn't an illusion but the 4th Prince Wang Soo who came and hugged her saying "I told ou to stay put and wait for me at Damiwon" Hae Soo told him he shouldn't be here as it won't be any good if someone sees them. But seeing his face she was suddenly worried by he is wearing the mask again did he forgot to put on the makeup and hide the scar. 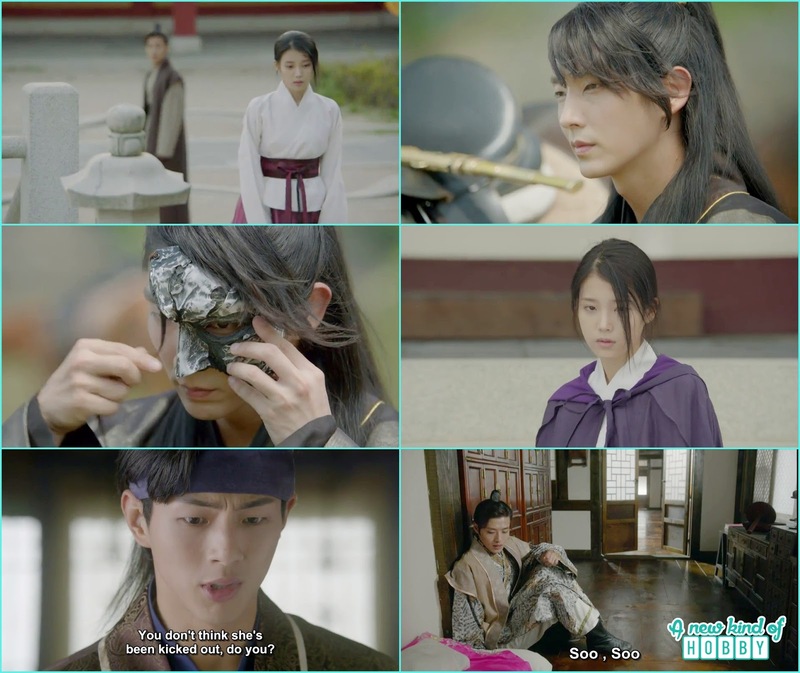 The 4th Prince clear her confusion saying the mask he wear wasn't because of the scar it was he don't want to forget about her. Waoo we were so touched by him he really has a loving heart and a man of his words rather then compare to 8th Prince Wook. He then take off the mask. We were missing the 10th Prince and yet he was having one sided fun with his wife whom he didn't accept by the heart. It was a lovely scene of their nitpick fight and both really look adorable arguing over nothing. But Sun Duk father become more jealous seeing how caring she become for her husband. As the time pass the king become old and his health was down. He started to loose his appetite Jin Monk bought him tea he didn't drank but the fragrance made him ask who made it. We thought as Ji Monk its a new court lady but we were sure may be its Hae Soo who made this tea. The King also conclude may be its the same girl and ordered Ji Monk to call her. Now we were worried for Hae Soo what if she was being again punish for making tea for the King what will going to happen. But on the other hand we were relaxed that the 4th Prince is back and he will surely stand by Hae Soo's side no matter what the situation will be. 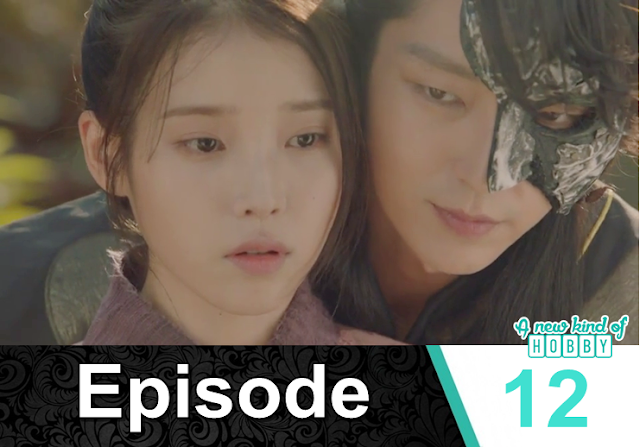 Hae Soo cam to visit to the King she was a little scared as she already received the two punishments and her life is being less miserable then the hell. King ask her who really she is, where did she came from and also told her that he searched her hometown ask her friends and family members they all said she changed and didn't act like the Hae Soo they knew. Then King conclude himself saying may be you are like Ji Monk you know the future but you have be very careful and stay put not to interfere in palace affairs it will be good and its my advise for you to let things go the way. To me you are a daughter as Song treated like a daughter. It was another beautiful scene of Baek Ah and Woo Hee while Baek Ah was playing the beautiful music and Woo Hee was practicing her sward dance. She couldn't mange her balance and missed the step and fell down. Baek helped her and happen to see the cuts on her wrist he became all worried and scold her for being for so careless while practicing. Woo Hee feels burden and told Baek Ah that its not wile he is practicing on Bae Ah's music but it happen before they met. Hae Soo and Woo Hee happen to friends. Hae Soo ask Woo Hee about Baek ah and told her that he only came here because of her. It was the party arranged by the 3rd Prince his uncle and 8th Prince Wang Wook in order to celebrate King's health. It was their outer motive but inside they were planing to assassinate the King. The 4th Prince Wang So ask Hae Soo lets get married. Hae Soo refused and the 8th Prince Wang Wook came there. The atmosphere was become more of tense, the 4th prince couldn't stand the 8th Prince interference in his matters. They argued and Hae Soo become more of scared. She remember King's advise to stay put the thing as it is and not change it if she did so she will be the one suffering. So all the time till now Woo Hee was preparing the sward dance for today's occasion. Her appearance didn't give us good feeling as seeing her facial expression and the strange gaze in her eyes. What if she will gonna kill the person infront of her. It wasn't our prediction but it was the reality Baek Ah noticed and finally understand Woo Hee's true motive. He jumped infront of Woo Hee to stop her from attacking the king and it was too sudden at first we couldn't understand what happened the King fainted and the peoples attention was on the King. No body notice Woo Hee neither injured Baek Ah. The episode ends here. We feel really sad for Baek Ah as he got stabbed by the women he really loved. What will going to happen next will Woo Hee able to escape or will she receive the punishment from the King.